The Tire Rack returns as the title sponsor of the One Lap of America for a 15th consecutive year. We feel an even stronger commitment to the One Lap and ensuring it can carry on the legacy of Brock Yates. Tire Rack, America’s largest independent tire tester and consumer-direct source for tires, wheels and performance accessories, celebrates its 15th year as the title sponsor of the One Lap of America (http://www.onelapofamerica.com), a charitable street-legal road rally race started by the legendary auto writer, Brock Yates, 34-years- ago. The 2017 Tire Rack One Lap of America begins May 5th at Tire Rack’s state-of- the-art 11.7-acre test facility in South Bend, Indiana, and returns there for a final test eight days later on May 13th. During that week, drivers will race at storied iconic and new tracks alike such as Road Atlanta in Braselton, Georgia; Gingerman Raceway in Michigan; the new road course at Dominion Raceway in Thornburg, Virginia; and the historic Sebring Raceway in Florida. This year, close to 100 teams will be covering over 3500 miles during the nine day competition. The Tire Rack One Lap of America is a high level driving competition lasting 24 hours each day and features a selection of the fastest street-legal cars run by all types of drivers from pros to rookies and everyone in-between, as long as they’ve had some racing experience (and/or two drivers' schools). The event, as it always has been, is one of endurance and vehicle preparation. No support crews are allowed and teams must manage their tires to finish on the same set on which they started. That means frequent checks of air pressure, tread depth and wear and tear for damage. At each scheduled race track entrants are put through a series of timed lap trials including wet and dry skid pad challenges. Even though scoring is based on performance at the race tracks, the vehicles and their drivers’ bragging rights truly kick in when they survive the long distance of driving miles required throughout the competition. Outside of its performance panache, Tire Rack One Lap of America also attracts people from around the country and all walks of life, driving cars as varied as their personalities, for a good cause. The official charity of the Tire Rack One Lap of America is The Brock Yates Memorial Fund, a 501(c)3 non-profit. The Brock Yates Memorial Fund, through the Alzheimer's Association, was created in 2013 to raise money and awareness Alzheimer’s. Having suffered from this disease, legendary automotive and racing veteran journalist Brock Sr. dedicated his life to all the car enthusiasts around the country and the Memorial Fund aims to honor him for all that he has given to the world of the automobile. All funds raised by the Memorial Fund go directly toward supporting the Alzheimer’s Association mission. The Memorial Fund, will once again be competing in the Tire Rack One Lap of America with the Tribute Fund’s heavily customized Ariel Atom piloted by Jack Beachem and Victor Leo. Tire Rack, family-owned and headquartered in South Bend, Indiana, is America’s largest independent tire tester and consumer-direct source for tires, wheels and performance accessories. Their team of over 100 test drivers (their sales team) tests tires from every major tire manufacturer on the company’s state-of-the-art, 11.7-acre test facility. The findings are then posted on the company’s website, http://www.tirerack.com, where consumers can make an educated decision on a tire, wheel or performance accessory purchase. Tire Rack has also collected results from nearly 150,000 consumer surveys representing over 2.5 billion miles of real-world tire data, the largest known cache of such information anywhere. In addition, various testing and informational videos are available online in their Video Center at http://www.tirerack.com/videos. 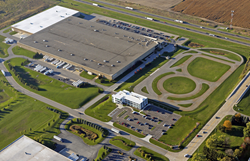 Since 1979, Tire Rack has grown from a single-point retail store in Indianapolis to encompass over 2.5 million square feet of space in nine distribution centers across the country. A diverse and broad in-stock inventory from 24 major tire and 63 wheel brands can be delivered anywhere in the country, most in one business day. A national network of over 7,500 independent Recommended Installers is available to assist customers with installation of their purchases. The Tire Rack One Lap of America Presented by Grassroots Motorsports Magazine is the modern day version of the Cannonball Sea to Shining Sea Memorial Trophy Dash of 1970. Created by Brock Yates and popularized by the movie Cannonball Run, todays One Lap of America challenges its participants to endure long transit drives of over 400 miles daily and to compete on 12 of Americas most challenging racetracks in 9 days. This year’s One Lap begins on May 5th, 2017 and runs through May 13th, 2017. The current event is headed by Brock Yates, Jr. and will be celebrating the 34th running of the event. The full schedule is available online at http://www.onelapofamerica.com and on Facebook.